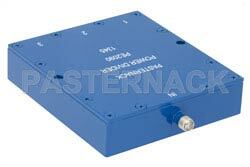 PE2090 3 way SMA power divider (also known as a SMA coaxial power splitter) is rated for a minimum frequency of 690 MHz and a maximum frequency of 2.7 GHz. This Pasternack 3 port SMA power divider / coaxial splitter has a 50 Ohm impedance and a maxium input power of 10 Watts. Our SMA coaxial RF splitter / divider has a female SMA input and 3 female SMA output ports. 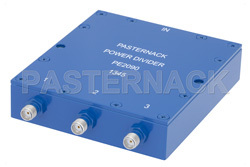 This 3 way SMA RF power divider from Pasternack is a wilkinson design and has a maximum insertion loss of 0. The maximum input VSWR of this SMA wilkinson splitter / divider is 1.4:1 and the minimum isolation is 22 dB. Our 3 port SMA power divider is one of over 40,000 RF, microwave and millimeter wave components supplied by Pasternack. This wilkinson 3 way SMA female coaxial RF power divider splitter can be bought and shipped worldwide the same-day as with Pasternack's other in-stock RF parts.